Whyyyyyyyyyy can’t this book be canon? 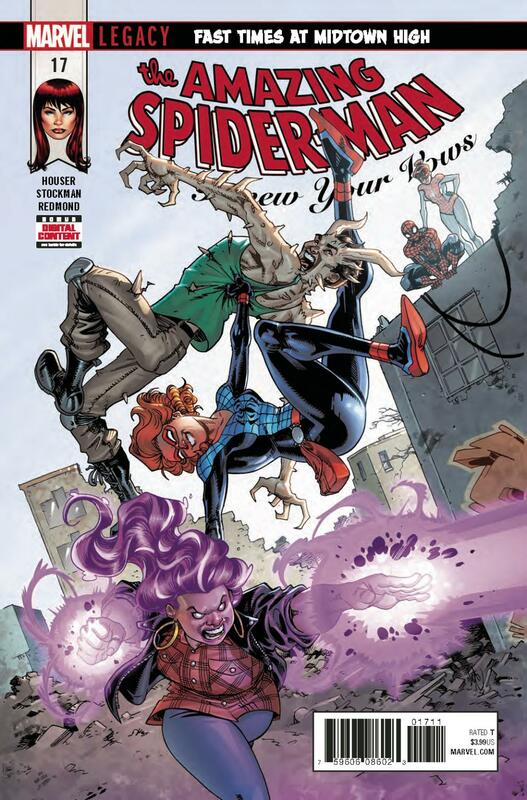 Renew Your Vows is still filling the void left in my heart by Dan Slott (fingers crossed for Nick Spencer!) for a book that gives us the things we really want from a Spider-Man title in 2018. As far as I’m concerned, it’s currently the best we’ve got. Even then, it’s not perfect, but issue #17 is a fully enjoyable experience that makes me thankful to have this book at all. Mild spoilers below. Last we saw Annie, she had stumbled across some brand new super heroes(?) in the drama club, and she just wouldn’t be a Parker if she didn’t consider them her responsibility. This is a move that intelligently plays to the strengths of this book in comparison to other Spider-Man titles. Annie (and Mary Jane’s relationship with Peter) is what Renew Your Vows has that others just don’t, so if she weren’t in the spotlight or at least receiving a great deal of focus, it would surely be a missed opportunity. It’s who she is that allows for such remarkably refreshing stakes. It’s never the end of the world. It’s not life or death here. It’s just high school super heroics. I know like most people, when I hear “Marvel,” and “back to basics,” I have the slight urge to throw up, but in this case it’s so natural and not forced because it’s technically not back to basics. It’s a new life for Peter and MJ, and a new environment for Annie that is similar to what we’ve seen before. And thankfully, the script is on par with the ideas here. Jody Houser loves to throw in references to the absurdity that is the larger Marvel universe and they always get a chuckle out of me. Dialogue is never, “how do you do, fellow kids?” It feels like a genuine relationship between father and daughter, which in this book is imperative. Nathan Stockman is as good a fit for the book as ever. His art reminds me of what you’d find on the cover of a children’s piano lesson book, but with significantly more effort put in. Arms and legs can be a little shaky, but not in a way that ever sticks out and ruins the panel for you. It just seems that some illustrations could have used a bit more time to develop. Action is easy to follow. I thought it was a nice touch to give Annie an old school X-Men mask since she was a student with them. Where Stockman really succeeds is in faces and body expressions. Masked or not, a character is always showing you exactly how they feel, even if they’re not always telling. Anger and fear are clear to see, also thanks to Ruth Redmond’s shading. I do think, though, that backgrounds could use some more variety. They often just get two tones that fill up the entire setting, when the setting itself actually allows for much more. It feels a bit like cutting corners.